Italian suppliers contribute substantial content to the Alfa Romeo's entry-level car, the MiTo hatchback, which was launched at the British auto show in 2008. Magneti Marelli provides the telematics system, the exhaust system and the rear lamps and fog lamps while MTA, an electronics components specialist, supplies the power distribution box, radiator cap and battery terminals. Brembo S.p.A. supplies brake components while trim specialists Saturno contributes the sun visors. 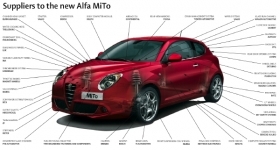 Fiat Powertrain Technologies (FPT) builds the MiTo's engines. Two gasoline and one diesel engine were available from launch, each mated to a six-speed manual transmission. The diesel lowers particulate emissions by 80 percent and CO2 emissions by 20 percent compared with FPT's previous-generation powerplants. The turbocharged gasoline engine reduces fuel consumption by 30 percent compared with the previous-generation design. The MiTo's 1.4-liter non-turbocharged gasoline engine was designed to meet new Italian laws, which limit the weight-to-power ratio of vehicles for drivers who have just passed their driving tests. Important non-Italian MiTo suppliers include TRW Automotive, which delivers the electric powered steering (EPS) mechanical gear. This fully electric system eliminates the need for hydraulic fluid, along with the associated hardware demands and problems of leakage. It is estimated that EPS saves automakers about 190,000 liters of hydraulic fluid for every 100,000 vehicles produced. It also helps reduce fuel consumption. BATZ Automotive Systems supplies the pedal box. By replacing steel with plastic parts, the Spanish supplier has achieved a weight reduction of 1.25kg per vehicle. In addition, the "snap-fit" union design has removed the need for screwing and welding, making the assembly process easier. Alfa Romeo builds the MiTo in Turin. The car's name, MiTo, is a composite of Milan - where the car was designed - and Torino (Turin). Speaking in June 2008, the then-Alfa Romeo CEO Luca De Meo said MiTo production was targeted at between 70,000 and 80,000 units per year but later the company announced reduced production in the wake of the economic downturn. MiTo prices start at 10,745 pounds (12,147 euros) in the UK.